Hi there, I hope you can help me, I have adapted your theme Andia and its really working well, there are some questions that I would like you to help me with if possible. I love what you have done and I am learning a lot from the way you do things. Can you help me with the php mail form, at the moment I am not getting the NAME return, also I have added a PHONE field where SUBJECT used to be, that is now working but the phone is coming up as the subject of the email. What I would like is to be able to add other fields such as AREA, PRICE RANGE etc but now not even the NAME is being sent via email, I am just getting the EMAIL FROM , PHONE (subject) and MESSAGE. What am I doing wrong? Also in the testimonials area, there are two issues. 1. how does it work on other pages where I want a different testimonial to be there? also can it cycle through them like the slideshow but for text? 2.in responsive smaller views such as on an iPhone, the text in the testimonial goes to a very thin long column rather than wrapping around, can this be fixed? 1. If you also look at the slider in a small responsive viewer such as iPhone the left and right navigation arrows stay very big which looks odd. 2. If you click on one of the thumbnails the slider jumps to the picture which is fine, but then the slideshow stops, could it be set so that when there is interaction it stops, even just hovering the cursor over the big picture, and then it carries on when interaction is over? that is how i have it set on another site i did here: http://www.fivestarluxuryclean.com but i cant see how to do it on your system. I would love to help you with feedback like this by the way, I think you have a great style so let me know if you want me to get through anything with suggestions. I’m glad you like my theme. I have a services page for customization work as you can see here: https://azmind.com/services/. 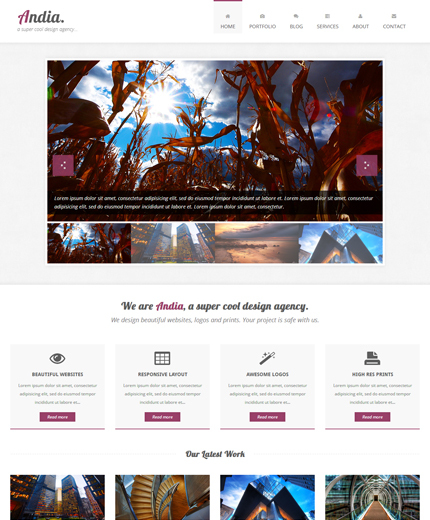 I like your theme, and I am interested to use this in my portfolio website. It’s really great design, but I am facing a problem only on my chrome browser, i.e. It view is stretched on Chrome, but working perfect on Firefox and Safari. This design is working fine on my friends Chrome browser as well. Could you please help me, how can I fix the design issue with my chrome. This is your Chrome’s problem, I have no idea. Hello, very nice! great work! How I can modify the map to use with another address? I don’t understand where is the address to modify. Thanks alot! so easy to do! Hi Anli, I wrote one week ago but I don’t have no email. I think that there is a problem with my email. Your theme is beautifull, very nice and innovative. How to change the address in the map? The question may be simple but I don’t understand how change the address to modify tha maps with another address. Please Anli, can you replay? Hi Mark, there is no problem with your email. If you see above, this template has more than 4000 downloads so, it’s difficult for me to reply to all questions immediately and also continue creating other freebies. Replace the 45.06.. and 7.68… with your coordinates. To get your coordinates make a quick google search: “how to get google maps coordinates”. 4000 download are a good satisfaction! very nice! great work! Sorry Anli but I use Chrome and I have same problems: I didn’t see my first comment in the page of your site. I have just one issue though. In the portfolio page When I click Logo Design/ Web Design filters, the bottom part of the list items are clipped and overlapped by the footer. Can you please help. Did you get a solution for this ? Hi, I loved downloading and using Andia template. It is beautiful. I had one problem. I couldn’t figure out how to get my google maps co-ordinates. Luckily, you answered someone else’s question. I figured out how I can get my locations co-ordinates. It worked like magic.Thanks a lot, buddy!. Thanks so much for the template!!! Fits in perfectly for what I need! Just a quick question, how do I change the email address that the contact form sends to? Hi Ned!, i have a same question. could you do it? Help please!, i have the same question! It looks like IE is adding a background gradient to the Nav Menu. It does not appear in Firefox and Chrome. I plan on converting this to a wordpress template and selling it on my personal site. Is there a fee involved if I wanted to do this? How do you see this working? You have to modify the graphics so it doesn’t look like this one. In the future I may convert this template to wordpress and release it for free. Thanks for this template it is really cool. I am having trouble with the flex slider caption being compatible in IE. I was wondering if anyone has encountered this, and if so, if anyone has come up with a solution. Great theme – thank you! Hi, and thank you for a beautiful looking template. I have successfully edited the layout to suit my needs. I am having a problem changing the images in the Portfolio container though. Every time I change one of the images, the hieght, width or both of the spans contained within change. I would like to change the images simply by pointing to a different source file. Please tell me what stupid mistake am am making and how simple I am for not spotting it myself. Thanks a lot for the template. I hope I can use it for commercial purpose with a little modification in UI. Hey guys, thank you a lot for collaborate! this is an amazing one. Really liked it . Can you tell me, will this only work within a WordPress powered site or can the template be used without WP as a standalone site? This is not a WordPress theme, just a HTML theme. Yes, it can be used as a standalone site. Great job man, but i have issues, the template is not compatible with IE and the flex slider is not responding fast when uploaded but on my local system is working well. Can you pls help resolve this. Thanks, I’m glad you like it. The template is not compatible with IE 6-7-8, but is compatible with IE 9 (and I think also with IE 10, not tested though). Hi, how do you change the Pink colour to something different? Where is colour setting stores? You have to edit the “style.css” file. Thank you, Anli ! This is a great theme which i am using it for a photography portfolio website ! You are such a good HTML website creator ! Hey so I’m practicing my HTML/CSS3 skills with this template by reorganizing and editing. I ran into a little stumble though, I removed the “Andia” logo on the top left and replaced it with a google font, BUT for some reason I can’t get the h1 to gain size. I’ve tried the font-size property in your style.css file and some other methods but nothing is really working out. Is there intervening you might know of that is preventing me from raising the size of the h1? latest tweets do not update more: help me, please! Thank you for this awesome theme! One question: when using fewer images on the portfolio page, how can I center them? Removing an image creates a blank space in the gallery, and I prefer that the remaining images center themselves within the larger space. It’s not hard to do, but the challenge is not breaking the responsiveness in the process! I have a small business for building a website for customer, i like this template. O can use this template for my customer? How do I edit so there can be more then 4 testimonials? I’ve searched through every JS & CSS file and I can’t seem to find find or be able to edit it anywhere. I’ve never done a task like this. I don’t know, sorry. This is an incredible template and I’m excited to use it for my upcoming small business. I’m not familiar with wordpress and learning it as I got along. For this template i downloaded it on Dreamweaver. I looked on your demo and the blog section is missing. Im not sure why, but I would I was hoping you forgot and it’s wordpress friendly. If you there is a request by email to receive the blog section of the site please let me know. I have you bookmarked on my browser and enjoy everything i have seen. Hi, this is not a wordpress theme, sorry. Can I re-design and develop this theme and sell it ?? You have to modify it, so it doesn’t look like the original. Congrats for the great work and for this great template! I’d really liked it and enjoying to customize but I have a problem with Portfolio page. Neither on my PC nor at my hosting space and even not at your demo page it doesn’t work. I mean they open and enlarge but they are not switching with not with keyboard arrows or something. Can you help me with this issue? Thank you for the interest and quick reply! Really nice template. Can use this template? amazing work you are a great human. Very nice theme! Like how you used a logo that is more square than rectangular. many themes out there use very rectangular logo setups which makes it more difficult to accommodate a logo that is more portrait in orientation. Thank you for sharing!!! i have a problem whit installation in wordpress. This a really excellent theme – Thanks. One question, how do I increase the time delay between the page loading and the slider appearing? Hi, I’m Yedukondalu Ui and UX designer from Hyderabad, Andhra Pradesh, India. I saw your works which as you showed in to the webpage. i really happy with your bootstrap responsive template but now i downloaded on of your done by your template (andia-agency). that’s good. I block any area if any please support me.. Great job dud.. I wish you a gud luck.. I wanted to add an extra category to the gallery on the portfolio page to sort by, and you have made it so easy to do, that is just great scripting man! One question, would it be possible to link to from a page to an already sorted gallery on the portfolio page? Thanks for this great template. It has helped me to understand the structure and function of html5 and css3. I’ve checked other comments and your FAQ and can’t figure out how to replace the embedded Google fonts api with local fonts from my server. There seems to be a lot of “font” references in the html, boostrap, js and styles.css files. Do I just comment out or delete the fonts.googleapis.com stylesheet links in the html page headers, and replace them with local file paths, and also just replace the font-family refernces in the styles.css with my preferred fonts, or are there other refereces I need to change or delete as well? Thank you for your lovely template. I am having difficulty adjusting the hieght of the slider. Try as I might, nothing seems to work. If you could point me in the right direction I’d be an even happier man. can i use this templete for any project and make changes according to my requirements!! your templete is nice, can you make tutorial for it because it really help me to learn and explore new things and skills. I have a problem with the contact form : it seems to do not work. i’ve changed my adress mail in the php file and that’s all. thank you for this template which is really beautiful. But it doesnt work. I tried to get more information about prettyphoto on the official website but i didnt findt the way to solve my pb. In the portfolio page When I click Logo Design/ Web Design filters, the bottom part of the list items are clipped and overlapped by the footer. Can you please help. i want to ask how can i edit the picture and add another tab on the portfolio page you’ve created(e.g print design, web design, logo design) thanks i want to add another tab there and change the pictures. “I have just one issue though. In the portfolio page When I click Logo Design/ Web Design filters, the bottom part of the list items are clipped and overlapped by the footer. Can you please help.” PLEASE HELP!